Big name lenders and elected public officials attended a homebuyer’s fair, giving hope to new immigrants mainly from South Asia, that owning a home in and extremely expensive market like New York City was not a dream. Affordable housing is scarce across NYC, especially in Queens where low inventory, high demand, and the spillover of buyers priced out of Brooklyn are driving up prices, organizers said. The fair makes it possible to connect with housing counselors and lenders and learning about down-payment and other assistance programs. “It’s very important that you pay attention to the experts that are here and to Chhaya,” Sen. Peralta, whose district covers Jackson Heights, is quoted saying at the fair, according to a Chhaya press release. “Every year, this event gets bigger…. which means that more individuals are looking towards that American dream… This is the first step in a long process to make sure that you have that little piece of the pie,” Peralta added. “The mortgage vendors look forward to this event because they see an opportunity with South Asian buyers,” Aniqa Nawabi, spokesperson for Chhaya told Desi Talk. “For this community, aside from children’s education, housing is the next big foundation to achieving their goals,” Nawabi added. 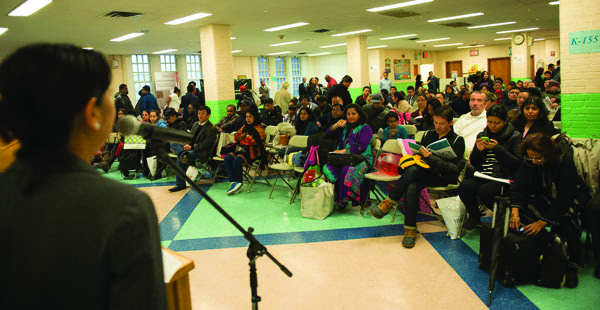 “Resources and assistance are hard to come by for prospective homebuyers in NYC who are not wealthy,” Afreen Alam, Chhaya’s Executive Director, noted at the opening of the event urging prospective homebuyers to take advantage of Chhaya’s services and the fair. Maha Syed, director of programs underscored the importance that Chhaya’s services provide. “In a city that changes so fast, providing housing counseling is essential in assisting low and moderate income immigrant and minority communities navigate an increasingly unaffordable and daunting real estate market,” Syed said. Every year, the fair hosts a panel discussion regarding homeownership trends and policies. At this year’s discussion entitled “Building Assets through Homeownership,” panelists from Legal Aid, Bank of America, HSBC Bank, Citi Bank, Municipal Credit Union, and SONYMA spoke about the nitty-gritty of the home buying process including credit and loan eligibility, applications and contracts of sale, affordable community loan products , housing discrimination, and fair housing laws. Chhaya’s Housing Preservation team also discussed down payment assistance opportunities and the roles of a counseling agency in the homebuyer process. The panel was interpreted simultaneously in Bangla and Nepali, and interpretation was provided in Hindi, Urdu, Punjabi, Arabic, and Spanish. Yangchen Chadotsang, Chhaya’s senior Housing counselor said the fair promotes “sustainable homeownership” and attendees often go on to complete Chhaya’s first time -homebuyer classes and to purchase their first home. Chhaya says since it was founded in 2000, it has helped “hundreds” of residents own homes through its services.